4 days into college the work has started and mixed with a lack of sleep from my steroids last night plus studying the bit of biology I did not understand last year I am feeling rather sorry for myself today! I went to ask about dropping one of my A level subjects and it all moved along so quickly that I didn’t have much time to think, which led to me feeling really unsure about everything! I really wanted to do four, but I do also really want to focus and do the absolute best I can in my main three, so hopefully I made the right move today. Sorry this is going to be such a ramble, I am a bit all over the place! I saw another Leukaemia patient’s post which I totally agreed with and have been meaning to write about for a while… her point was that sometimes she misses being ill. I know it sounds ludicrous… how could I miss being constantly poked and prodded and bothered? The truth is that life now seems simpler in those days. I adapted to my new life and had one thing to focus on: my daily blood results and just getting through my intense treatment. Plus it was totally OK for me to lounge around watching box sets all day! It didn’t matter if the steroids kept me up all night because the nurses would chat to me or I could just sleep it off the next day. I feel like being back at college my brain is on sudden overload. It’s another new normal altogether. I have to worry about homework and timing and outfits and lunches and to be honest it does sometimes leave me missing those lazy chilled days! I am not saying I miss actually feeling rubbish, of course not! There were many times when I felt frustrated with my lot and ached to be able to leave the hospital and doing something productive! I appreciate it probably doesn’t sound that simple to you either, I know I am a mass of contradictions right now but I think my brain remembers parts differently and forgets how often I wanted it all be taken away. I just miss having less responsibility and less to worry about. I didn’t have to worry about all the teenage dramas, I was primarily a cancer patient and that was my world. I imagined life all aligning really well once my intense treatment ended and thought that I would be so up for everything, but sometimes I need to take a step back and realise that I can’t just throw myself into a full normal routine again. This is where I feel a bit lost, as I am still readjusting and trying to find that all important balance of chemo, work, sleep and exercise… currently feeling like a one armed man trying to juggle way too many balls! Also I expected to feel amazing all the time once I started my maintenance and though I often I do, I still always have a nagging worry about relapse. I’m also now stressing about the fact that once a month I am going to be feeling really down and tired, which is not something I need when I am trying to stay alert in a three hour lecture! If only the steroid treatment was optional! If I’ve caught up with you recently I am sure you’ll have heard me use the phrase “back to life” which I do feel like I am, so despite the negative tone so far in this post, be assured that college life is going well overall! I have 4 main friends who are all lovely, two invited me to the cinema yesterday but the steroids had me racing to get home and lie down and another girl and I are going for something to eat or drink after our afternoon lessons tomorrow… TGIF! We got a large list of enrichment clubs today and some sound really cool, so I need to chat with everyone and work out what we feel like doing… I am tempted to go for cooking, zumba, badminton and rock climbing so far so that will take some debating! I made it through another zumba class this week (I even turned up without mum this time!) but I did have to stop halfway through as I felt a little off and thought it would be best to have a break seeing as I’d had chemo the day before… I did not want anything to happen in the middle of the scout hut with a load of strangers around me! 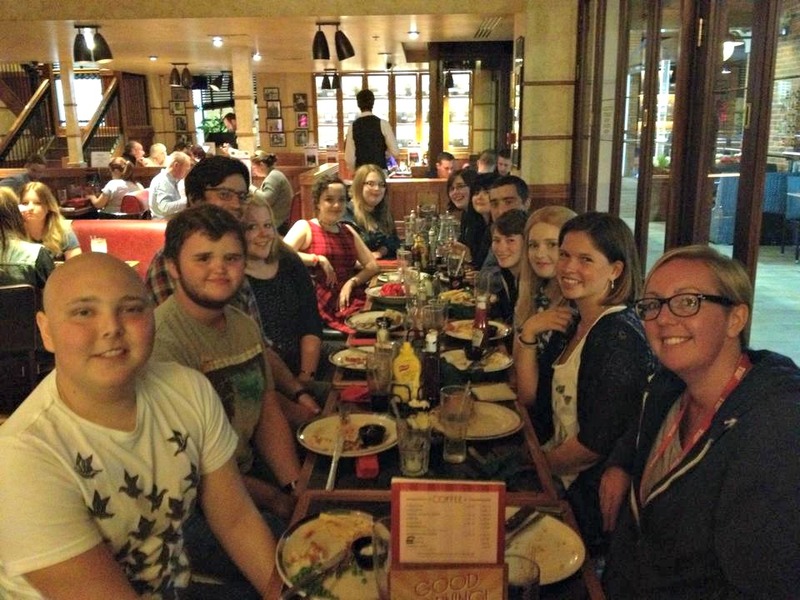 My other news was that I finally got to a TYA (teenage and young adult) meal, where all who have been treated on the unit at Southampton get a free meal out with CLIC Sargent. I had a great time catching up with everyone and was so relieved to finally be able to go… I’ve been eagerly awaiting one of these treats and free days out since last September! Here’s a photo of the table, including Ed, Emily and Ollie who I have mentioned quite a bit!